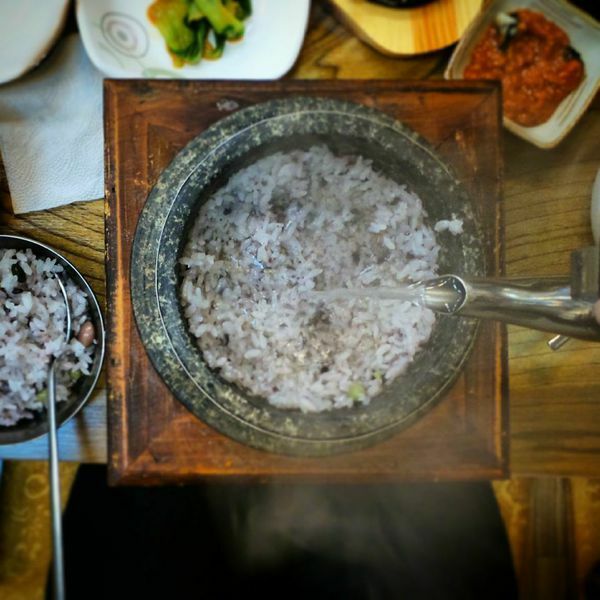 It can be a little intimidating to eat in Korea for a few reasons. Thankfully I was lucky to have a couple new friends show me the ropes, and read me the menus, not to mention share the food with me. Dining out alone isn’t common and it can be a little difficult to find a place that will serve a party of one. 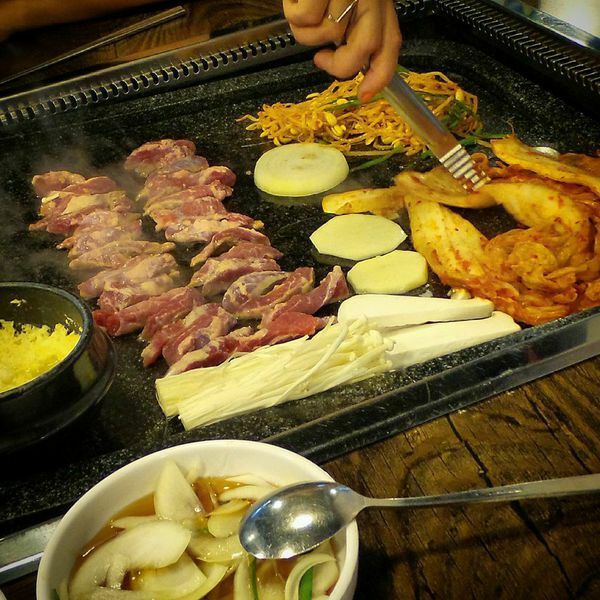 It makes sense as most meals are served in massive pots or on grills that are cooked in front of you with numerous sides. And although I’m a big fan of the point at a menu item and see what happens tactic, having someone who knows the food and can translate was a huge help. I was also very grateful to be steered towards some really delicious places. Lucky me, I could not have asked for better people to share so many meals with. So far I’ve had one bad meal in Korea which only served as a reminder that I was in fact eating very well. 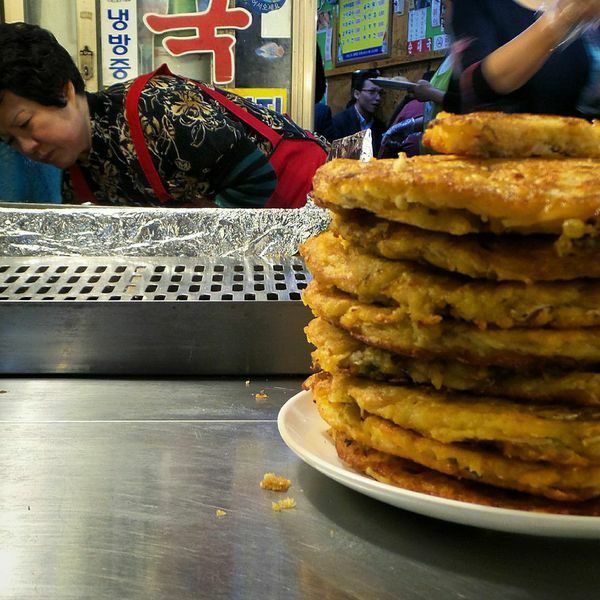 1.It seems like every country has a version of a potato pancake, and Korea does too. 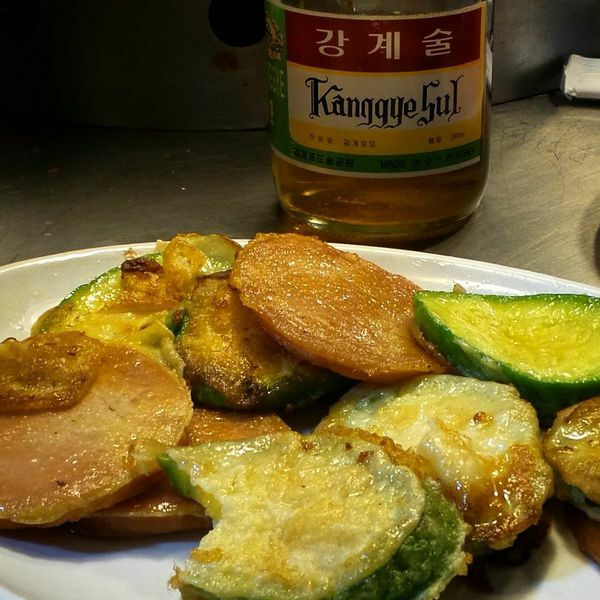 They call it gamjajeon. My favorite variation on this classic was made with thick pieces of potato, scallions, and a seafood paste cooked up crispy and delicious. 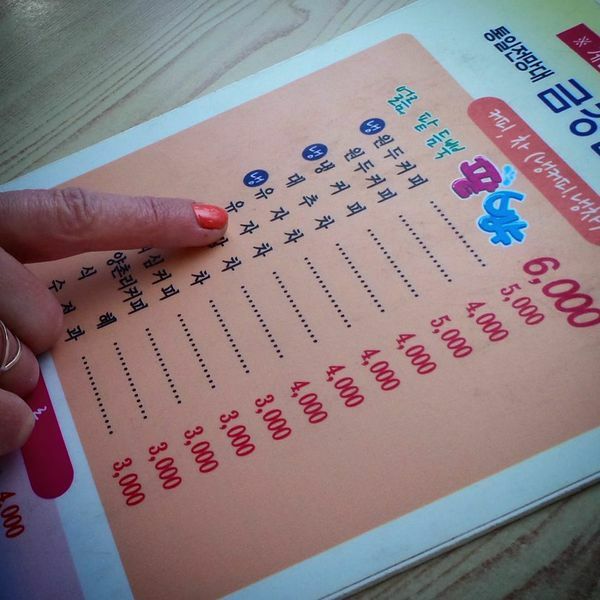 2.Spam, is kind of a big deal in Korea. It can be found added to a variety of dishes but it’s easy to find simply fried up with veggies. 3.Sundae, pronounced soon-day, and the opposite of ice cream, is my favorite snack. It’s a type of blood sausage that is boiled. 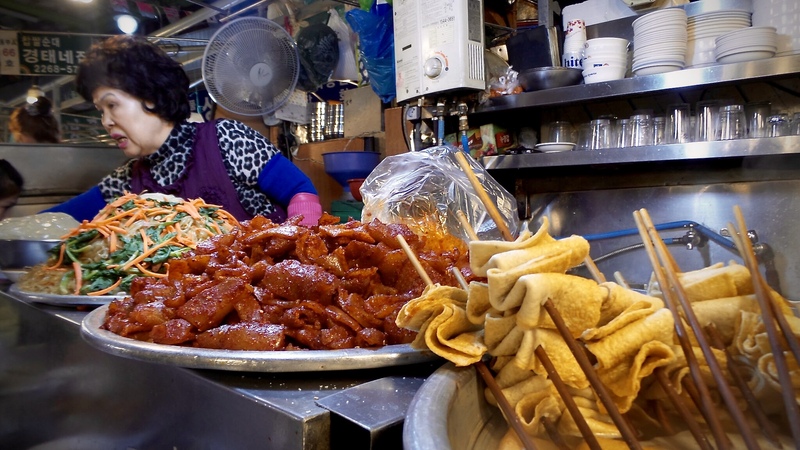 It is made usually of pork and sometimes beef intestines ground up with cellophane noodles. It has tons of flavor and great texture. 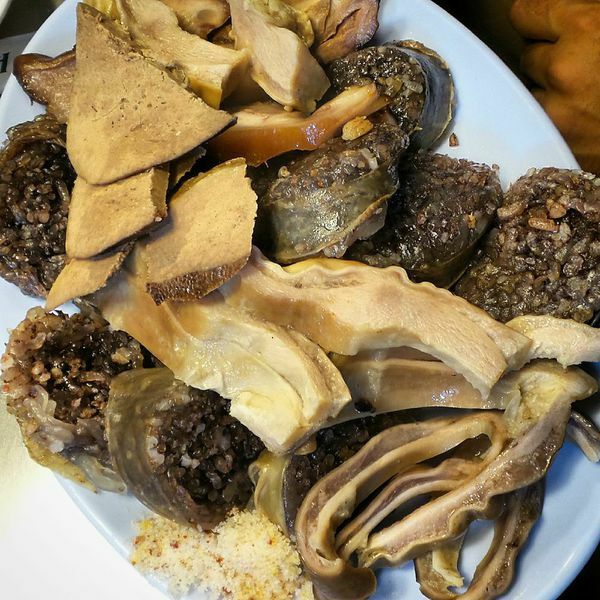 Sometimes it’s served with a plate full offal or added to other dishes. Squid sundae is also easily found on the east coast. 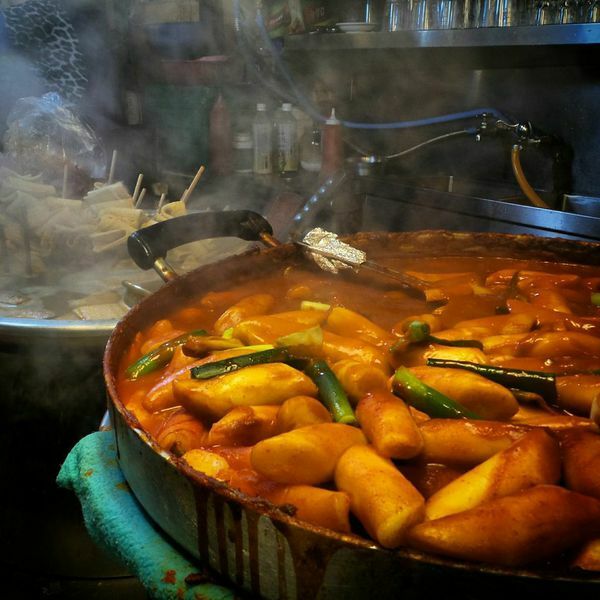 4.Ddeokbokki is an ideal snack to pair with beer, in my opinion. It looks like a noodle, has the snap of an old gummy bear, and comes in various sizes. It’s actually rice cake smothered in a spicy red chili sauce. It’s not my favorite but extremely popular. 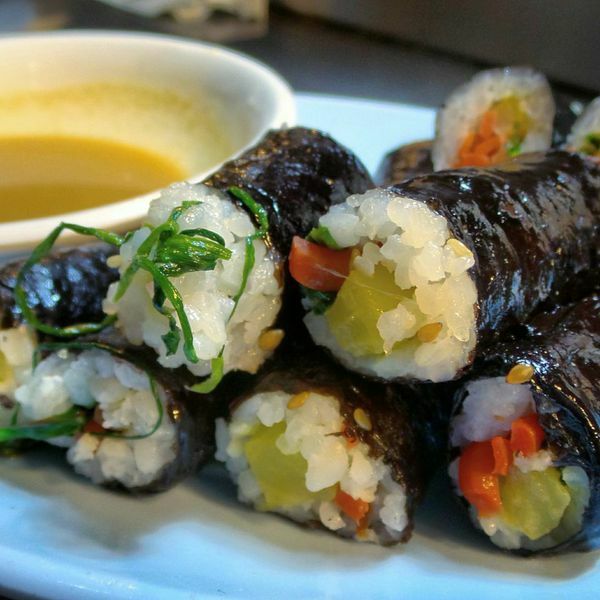 5.Kimbap is basically veggies and rice wrapped in seaweed. It makes for an easy, healthy, grab and go snack. They can also be filled with meat, tuna or kimchi. I love these, they’re perfect for a light meal when you’ve been eating like it’s a sport, which I have. Perfect picnic food. 6.Kimchi anything is awesome so why not put in a pancake? 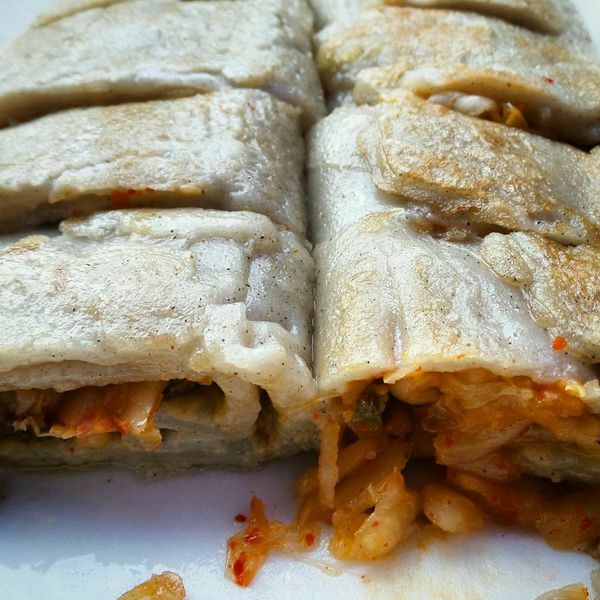 Kimchijeon is a slightly chewy, slightly crispy pancake wrapped around yummy, spicy kimchi. 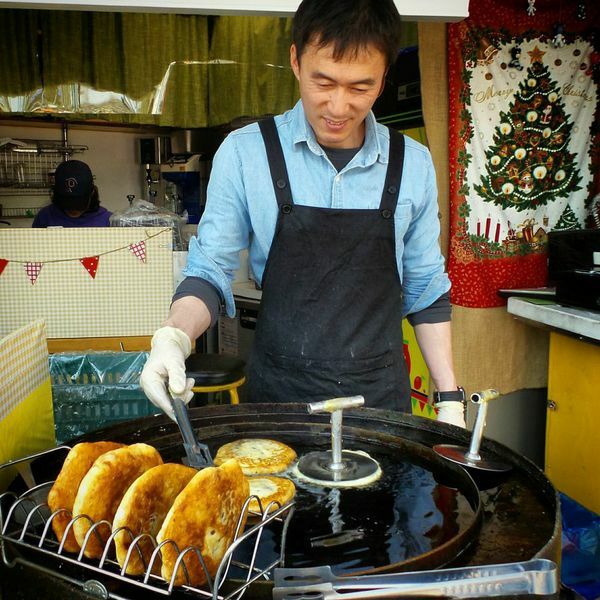 These pancakes (jeon) come with lots of other fillings too; an obvious choice for snacking. It’s easy to grab a seat on any bench in the market, ask for a beer, and start pointing to things you want to eat. I battle ordering hoddeok most days. It’s a delicious but terrible for you sweet treat. It’s essentially flattened fried dough filled with cinnamon, simple syrup, and peanuts. Done right, it’s fried food perfection with crispy but chewy dough that’s not too thick, not at all greasy, and perfectly distributed filling. It comes served in a paper cup for easy eating. Kalguksu is soup, but really good soup. 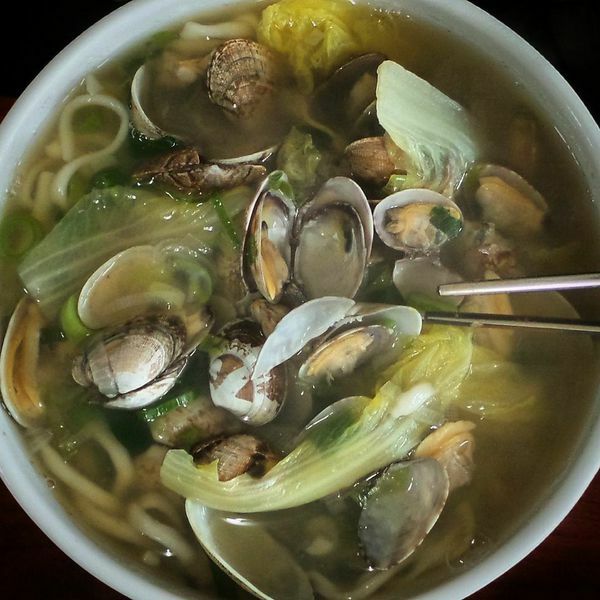 The noodles are knife cut and thick in a thin broth with seafood and veggies. Great for a light lunch and widely available. Ssambap, (lettuce wraps with rice) is my favorite. Sometimes I go bap-free just so I can fit more BBQ’ed meat into my ssam. One thing I love about Korean food is all the sides allow for you to DIY every possible combination to your heart’s content. The meal never gets boring. Don’t be fooled by the simplicity of the word lettuce, it’s not just romaine, but sesame, chard, pumpkin, and so many more types of beautiful greens that are served as wraps. 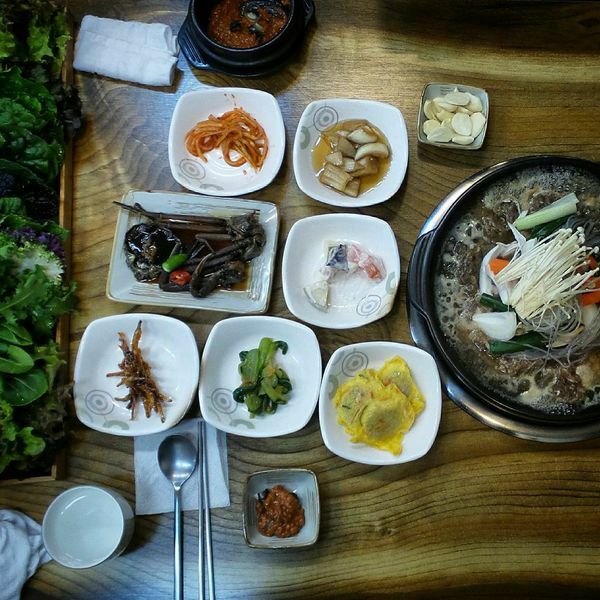 The sides vary but ssamjang, garlic, kimchi, steamed eggs, and veggies are consistently served in all varieties of BBQ or big pot meals. Some of the best sides I had included crab in a heavy, thick soy sauce (gejang), and dried, tiny, sticky anchovy (myulchibokkeum). At the beginning of ssambap, you take out your rice and place it in a side dish. The rice left behind, still stuck to the walls, is covered with hot water and left to sit while you enjoy your meal. Afterwards, if done properly, you are left with a sort of porridge believed to be good for digestion. 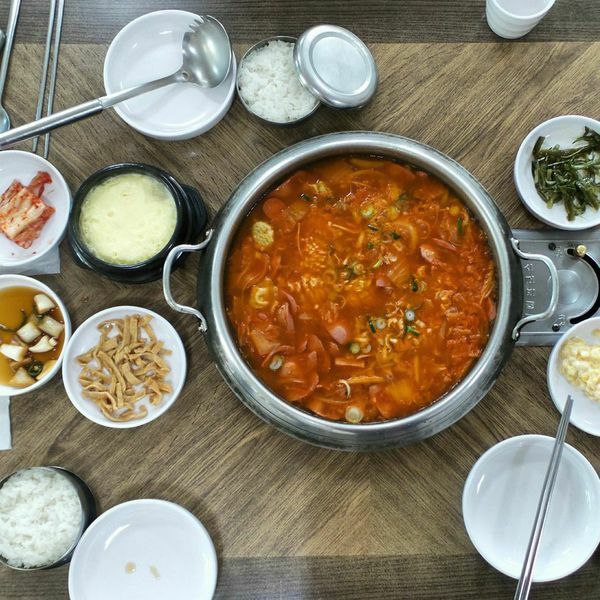 Budae Jjigae is fun to say and even more fun to eat! It’s also known as soldier stew. It’s a thick, stew like soup with everything but the kitchen sink thrown in. 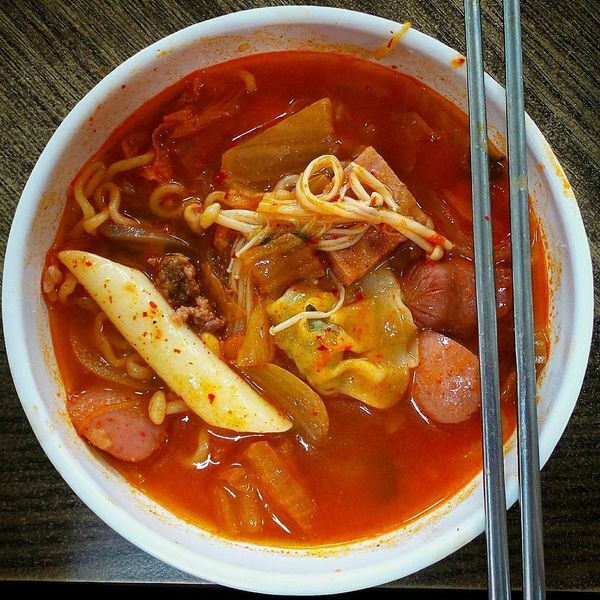 Hot dogs, spam, ramen, veggies, kimchi, dumplings, and ddeokbokki, can all be found swimming around this spicy delicious stew. This one comes with all the expected sides but also cold ones meant to off set the spice, like chilled creamed corn. I imagine this to be ideal hangover food. 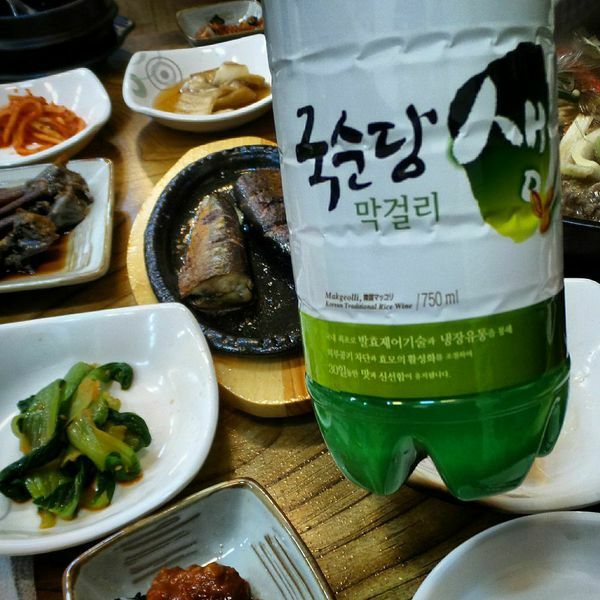 I did not have a hangover when I had this but I do love soju and makgeolli so there’s still a good chance I’ll get to test this theory. Galmaegisal is another wonderful BBQ that translates to seagull but is actually pork, but a cut of pork that makes you think you’re eating beef. Aside from the confusion, it’s extremely tasty. Luckily I had it served to me with muksabal as a side dish, which is cold soup with acorn jelly, seaweed, and sesame. The jelly (by itself is called muk) has a subtle nutty flavor made of acorn or buckwheat starch. 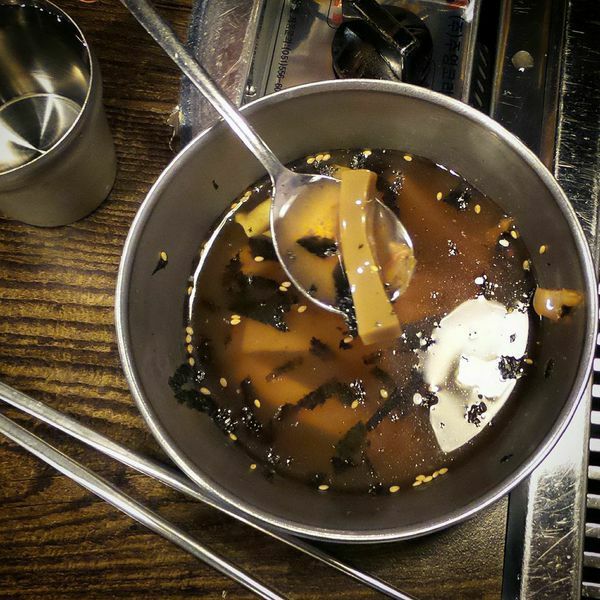 The broth has soy and a slight vinegar taste. It was a unique flavor and texture combination but grew on me quickly. Acorn jelly (dotorimuk) is also often served as a side seasoned but without broth. And now the fun, creepy thing to try...Sannakji! Live, squirming, slimy, octopus, and I highly recommend it. I think the best way to try this is at the market with a group of fellow backpackers who are all equally as unsure and excited to try this infamous dish. First find an adorable market lady that is eager to chop up live octopus and watch you eat it. 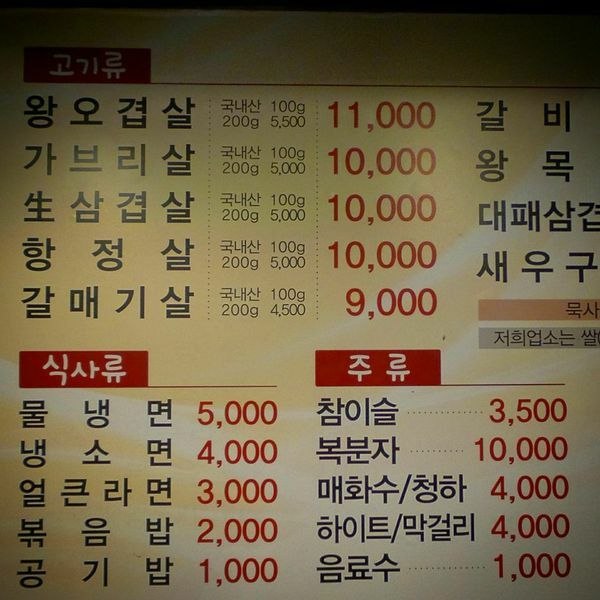 Next, order soju and don’t over think what you’re about to do. It’s going to be weird. We walked up and pointed to the tank with unsuspecting octopus swimming around. Without hesitation the lady running the stall sunk her hand into the tank and pulled out a live one. Giggly and excited to share in our experience she was very patient with us, even posing for pictures. Next thing I knew she was slamming her knife and eight squirming legs suddenly tripled. Happy with her portion sizes she scrapped the moving meal onto a plate and handed it over with a smile. It was seasoned lightly with seaweed,sesame, and a little sauce on the side. She laughed with us while we all tried to hold the slippery, fidgeting, little suckers between our chop sticks. I’ve had plenty of octopus, both cooked and raw, and I wasn’t worried about the texture. What one should worry about is the choking hazard. This dish isn’t particularly safe and has been known to kill. The tentacles are still moving and the suction cups still stick when you eat this dish. The trick is to keep chewing. To my surprise we all went in for seconds and thirds and ended up eating most of the octopus. It’s a strange feeling indeed, but once you get past the fear, it’s fun to have your food fight back. 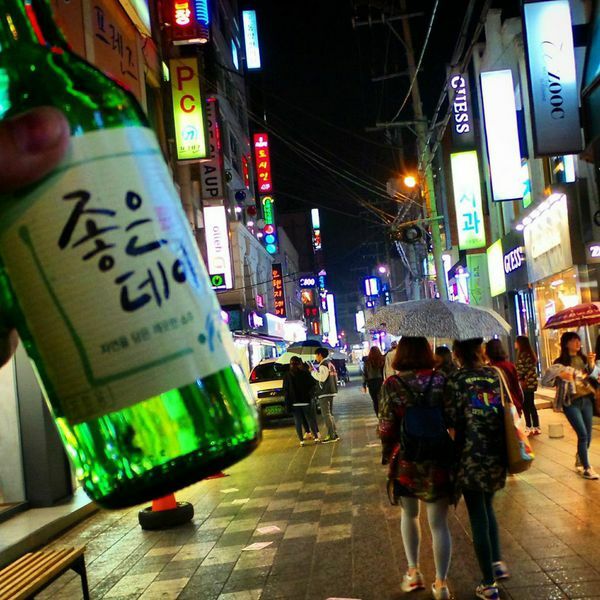 Korea isn’t shy about drinking so don’t forget to wash it all down with either beer, makgeolli, (a milky, fairly low alcohol, slightly effervescent, drink made from rice) or soju, (which is also usually made from rice but can be made from potato, or wheat, and is a bit stronger.) All of these are available from any convenient store, restaurant, or vendor. Since Korea allows you to walk and drink as you please, I recommend grabbing one for the road while you search out a place to eat. Cheers!